Raffle: Bill Abel brought ingredients for Irish coffee along with a six pack of Guinness. The District Assembly is coming April 6 in Bakersfield or April 13 in Oxnard. It is open to all Rotarians. Incoming chairs are particularly encouraged to attend. Quarterly bills were sent to each club member via email. Please pay your bill. Darren Doi will assist Sandra O’Meara with the billing in the future. 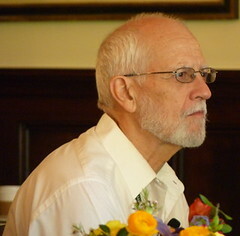 Tom Putnam was recognized as a Paul Harris Fellow. The Rotary Foundation is supported solely through donations. Sunrise has been a leading club for using foundations funds around the world. 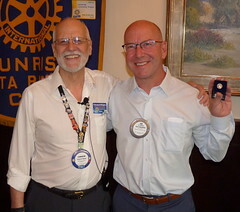 Scott Burns was recognized as a multiple Paul Harris fellow. He received the Paul Harris +2. David Velarde sent emails to those who have not yet made annual donations. El Puente Student of the Month – Rueben Laborito was recognized as he decided to turn his academic record around and he will graduate high school with his class. Rueben hopes to go to City College as a next step. Rendezvous at El Paseo this Thursday. PE Betsy Monroe auctioned two tickets to a symphony performance at the Granada this Saturday. Eric received them for a donation of $100. 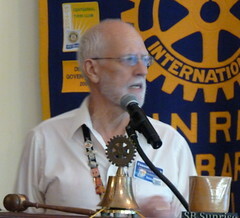 Program: Tom Heath presented about visiting Nicaragua. Mark Reinhart and Tom went to Nicaragua a few weeks ago. It was their second visit. Sideshow presented. They normally collect water with oxen. Trinidad Centrale water pipe is not even operational. Control system stolen out of the box. They had a $90k electric bill so that’s why the well/tank was disabled. Tank has holes in it. Another water source is the municipal well 4 miles away. You wait in a queue and load the water in oxen carts. Another community’s well consists of a water storage tank. It only operates for certain hours a day, not all the time. The two communities work together to get water. They visited schools and met a teacher at one of the schools. Also, community leaders came out to work with them. Becca, a teacher, is from Jubilee House, a partner organization. They talked to community leaders to find out what they wanted done. They visited Go Care’s facilities and met with the women that work there. They were a tremendous help. Water cistern system at Cuachillo school. Go Care has been installing community centers in various towns in the area. We may think about putting in a library or computer lab in a potential (empty) site. Big incentive from the federal government to have a sustainable garden. School grows plaintains and have a greenhouse in the back. They also have nut and fruit trees. Students use latrines/outhouses. No running water or sewage system. Becca’s daughter is a student in the school. Our new partner Rotary Club is the Rotary Club of Sandino. It’s headed by local community members plus Becca and Mike. They had a nice welcome party for Tom and Mark. The roads are basically the drainage channels. When it rains, it’s impassable. Visit to local resident named Ben Jamine (sp?). He’s 78 and his brother is 82. He’s one of the community leaders. He offered to have one of the wells drilled on his property. It would be great for a gravity flow system since his property sits so high. His sister is 80. She’s the middle child. Lots of animals on the property – sheep, chicken, goats, cows, pig. He was very dedicated to Rotary being successful in putting water into the town. Very concerned with his local citizens. They often run out of water. Takes about four hours to get water. Sister demonstrated how she cooks on her wooden stove. One of the biggest health issues is emphysema which is caused mostly by their home stoves. Mark taught how to make tortillas. Went to Cuachillo Two (Dos) – rehabilitate clinic there. Doctor comes to visit once per week but due to funding the building is no longer sanitary. They also don’t have the supplies they need. They have toilets and sinks but again, no water. Shutters are used to keep rain out but most are cracked or broken. Termite issues, roof are leaking, carpenter ant nests. Applying for grants to replace the roofing. Sidewalks needed to help people in wheelchairs into the clinic. Another clinic is in Trinidad Centrale and is in even worse condition. Trees growing in foundation. Built in the 1970s. Most of the buildings have bars and gates over the windows. If we get the wells installed, we would need guards on duty so things aren’t taken. They steal wood from the forest and then break it up into sticks to burn in their home stoves. They sell the excess. Also visited the top of a bridge which would be a good location for a gravity system water tank. Met with the mayor to get accommodations. He agreed to send a team of surveyors out to map the area. He also agreed to have a hydrologist to come out at the government’s expense to find out where the water is. Also authorized the state water agency to create engineering plans. Formerly wells were just installed by groups and they were not dedicated to the local utilities. There was no system in place to pay for the electric bills. In our situation, we would dedicate it to the state run water company. They would have a contract to maintain. They are currently spending $40 a month if they were to pay for their water (instead of fetching it). If she was using that the same amount of water through the water utility, it’d cost $2 a month. Luz Maria – the matching grant process is changing July 1st. The New Grants Models – district grants (simplified grants) focused on local community or international projects. Done through the district. Smaller projects. The second one is the Global Grants – create larger projects and sustainable ones. Global grants have match from TRF but district grants only have matches from the district. $36k is the minimum project that is required to be approved from TRF. We need more money, more partners. They are intended to be 1-5 years. It doesn’t have to be five years. The idea is we Rotarians adopt a community for the long term. Six to eight global grants over all the clubs in the district. We are anticipating 12 projects so it’s very competitive.